Innocent 100% juice for Kids is exactly that. 100% tasty juice, squeezed into a handy carton that's the perfect size for lunch boxes and little peoples hands. And because each carton provides 1 of their 5-a-day with no adInnocent 100% juice for Kids is exactly that. 100% tasty juice, squeezed into a handy carton that's the perfect size for lunch boxes and little peoples hands. 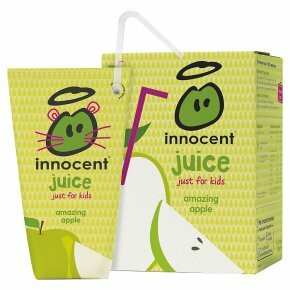 And because each carton provides 1 of their 5-a-day with no added nasties whatsoever, innocent juice is a great way to get more fruit into your kids.ded nasties whatsoever, innocent juice is a great way to get more fruit into your kids. Our 100% apple juice for kids is exactly that. 100% juicy, tasty apple juice, squeezed into a handy carton that's the perfect size for lunch boxes and little people's hands. No added sugar, no concentrates and definitely no bits. - made of 100% pure apple juice - comes in handy cartons of 180ml, which can keep for 12 hours outside of the fridge - 1 portion of your 5-a-day Our innocent promise: 1. Tasty products - No concentrates. No funny business. 2. Sourced sustainably - we use recycled & recyclable packaging, refuse to air freight and source ethically. 3. 10% of profits go to charity - find out more at www.innocentfoundation.org innocent drinks. Tastes good, does good. Shake before opening, not after. Perfect for lunchboxes Our juice will last happily out of the fridge for up to 12 hours, so they're perfect for packed lunches and days out.